Open scene on dad in shower, mom laying in bed, and toddler waking up crying. Toddler (crying): Want to go eat. Mom: Okay. Let’s go. What do you want to eat? Toddler: Peanut butter sandwich and banana. Toddler (eats bite of sandwich and starts crying): Don’t like it. Want pasta. Want turkey. Mom: You love peanut butter! Let’s take some bites! Pasta and turkey aren’t for breakfast. Maybe we can have those for lunch or dinner. Mmmm bananas. Toddler (crying): DON’T LIKE IT. Go lay in mommy’s bed. Want cars! Mom: Okay. Well, you have to eat something for breakfast and you can lay in mommy’s bed after you eat. You can have your cars when you start eating. Would you like something else? Eggs? Sausage? Toddler (SCREAM CRIES LOUDER): DON’T LIKE IT. GET DOWN. Mom (looks at dad with semi crazy eyes): This is why I don’t do breakfast. Toddler (sobbing hysterically): I WANT CARSSSSSS. Mom and Dad: You may have your cars when you eat your breakfast. Puts toddler back in high hair. Toddler (crying): I want cars. Toddler (crying): I WANT CARSSSS. Dad: If you want your cars you need to start eating. Dad leaves to go to work. Before dad leaves, mom looks at him with a “Don’t you dare ask me what I did today” look because, THIS, this is what I’m going to do all day. Hugs. XOXO. Toddler: I all done. Want to get down. Mom: Let’s take two more bites of banana because you’re two! Toddler: I don’t like baby bite. Not like it. Mom: All the bites of banana taste the same. The size doesn’t matter. Just eat two. Toddler (starts crying): DON’T LIKE BABY BITE. Mom (shoves two pieces of banana in toddler’s mouth): YAY you did it! You can get down and go play! End scene as toddler runs off to go play and mom lays head on kitchen table because, how is it only 7:50 a.m.? Because toddlers simultaneously make me want to 1) sob uncontrollably while laying in the fetal position 2) eat their faces off because they are so cute 3) laugh out loud 4) pull my hair out and 5) lose my will to live. You can read part 1 here. I would like to ask my doctor for a Xanax prescription. Because, meal time with a toddler. My husband and I have started having “second dinner” because 5:30 p.m., really? Unrelated: why did I have to unbutton my jeans while sitting the other night? This afternoon I sat on the couch checking Instagram while my toddler blew a piece of trash around the living room. YOLO, ya know? Why is Wyatt on the ground crying? I wouldn’t let him scratch a mole off my face. So there’s that. Did you know you can “read books wrong?” Yeah, me either. He asks for snacks all day and refuses to eat at meals. Again, YOLO! I don’t understand the whole: “I’ve been up all night for all of the nights with my toddler but I #wouldn’twanttobeanywhereelse” mentality. Have you ever heard of in your own bed asleep? Because that’s always the exact place I’d rather be. But have you ever stepped on a matchbox car? Because that is the exact way my child is going to learn how to cuss. Because what’s worse? Cutting your arm tendon like the guy from 127 Hours or trying to explain anything to a toddler? Hate (v): to cancel a play date after your friend has already told her toddler about it. Used in a sentence: So. Yeah. Buddy. We actually aren’t going to play with Emma today because she is sick their hearts are full of hate. [56 hours later and we’re still talking about playing with freaking Emma] LET IT GO, FOR CRAPS SAKE. I’m just a girl standing in front of a boy telling him he cannot bring 27 cars with him to church. How many words can two ears hear in one day before they explode? Asking for a friend. The good news? I finally finished blowing and filling up the kiddie pool in our backyard. The bad news? Summer is over. Want to know what life with a toddler is like? Have a friend set 19 random alarms that will go off during the night. Run a full marathon tomorrow. This will actually be my next baby shower gift. Do I work out? I carry around 30 lbs of dead weight because my toddler “fell and hurt knee.” Two week ago. So yeah, I work out. Is there anything else? My favorite part about dinner is waiting for the bowel movement my toddler will inevitably have. Nothing wets the appetite quite like a runny BM halfway through the meal. Except the opposite of that. Try to explain rest period at the pool to a napkin. That is life with a toddler. Okay buddy, you can play with my thongs you pulled out of my drawer. Said no mom ever to her toddler. One time I served a broken cracker. One time I peeled his banana. One time I opened the crayons at a restaurant. One time I gave him grapes when he asked for grapes… Surely this is what The Bible meant when it said, “there will be weeping and gnashing of teeth.” No? And so on this certain day of whatever year it was, I stood in the foyer of my childhood home, awaiting yet another spanking from my dad. Me sweating it out. He giving a speech of a lifetime and preparing his arm for the activity that lay ahead. There were bogus statements made like, “this hurts me more than this hurts you” and “I’m doing this because I love you.” There was a “heartfelt apology” on my behalf. Then out of nowhere my dad looks me dead in the eyes and says, “You know, I can laugh and spank at the same time.” AND THEN HE DID. I swear to you. Stone cold. He laughed and spanked me at the same time. I may or may not have been yelling things like: BUT YOU LAUGHED!! THIS IS ABSURD! HOW CAN YOU DO THAT!? MY JOKES WERE SO FUNNY! OWWWW! WHAT THE HECK, MAN!?! And then last night, we were eating dinner and Wyatt was putting on a legit comedy show. Like, we may start charging actual dollars, legit comedy show. [Someone help me. I see exactly one trillion parent teacher conferences in our future.] I had lost my will to keep a straight face. I had also lost my will to live because, I CAN’T STOP LAUGHING AND I’M SO OVER THIS AND EAT YOUR FREAKING DINNER. I said in my best Mother Theresa voice that if he didn’t stop acting like Eddie Murphy and eat his food, I was going to take his car away that he had brought to the table. He said okay. He did something hilarious, and we both busted out laughing. Wyatt took the bait. He refused to take another bite, and did another thing hilarious, like I WILL WIN THIS OLD WOMAN. And then I took his car away because, bring it child I’ve already lived your life. He started crying and out of nowhere I leaned in, looked him dead in the eyes and said: “You know Wyatt, we can laugh and discipline at the same time.” Because, OMG WHAT!? Touche dad. You win. It’s not even all that hard to do. 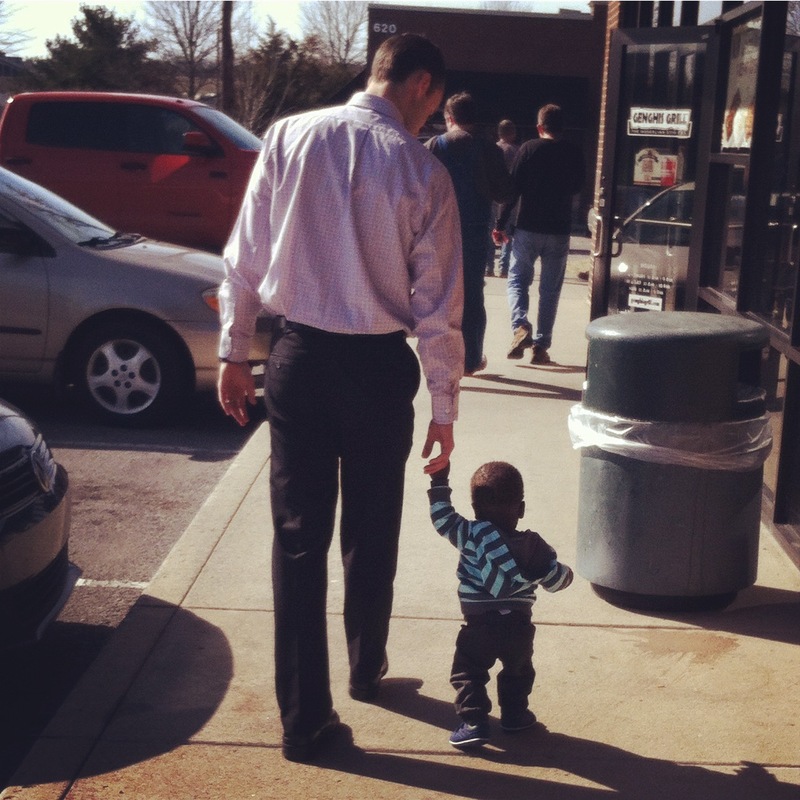 Whenever we started the adoption process I remember praying so hard for our child, whom we knew nothing about. We prayed two kinds of prayers back then. We prayed “alive” prayers and we prayed “not born yet” prayers. Because when you don’t know anything, you pray for everything. And so we prayed. Our “alive” prayers went something like praying for safety, a full tummy, and health. We prayed he knew he was loved and wanted. We prayed for healing in his heart- for the hard things he had undoubtedly experienced. We prayed for his heart to be opened and prepared for the change that was about to go down. We prayed he was happy and that he spent all the days laughing. We prayed for his caregivers- for strength and love. We prayed, always, for biological parents- that if there were any way they could raise him they would. We prayed that if there was another option, a way he didn’t have to lose his everything, it would happen. And then we prayed “not born yet” prayers which sounded a little different. All we prayed for was his biological mom, because really that’s all there was to pray for. We prayed she was safe and healthy, and that she had enough food. We prayed she felt loved. We prayed support would rise up around her. We prayed for resources for her. We prayed she would choose life. We prayed for things like the delivery and we prayed she didn’t have to do that part alone. We prayed that if there was any way for her to do this, keep her baby, she would. And so for months we prayed those two prayers. Over and over and over again. Then we met JT, and those prayers shifted a little. We had a face, a name, a smile to pray for. And so we prayed, and then we went, and then we came home. Y’all know. And I will always be weirdly grateful that sweet boy didn’t have to lose his everything- that Uganda is still his and always will be, grateful that he’ll grow up knowing that red dirt in his heart. I so remember getting chills when I read JT’s story, because May was a big (sad) month for him and May was the month we both felt so strongly that we were supposed to start the adoption process. And I don’t think for a second that was a coincidence. If God could part an actual sea, why would he not be able to burden two people on behalf of a little boy a zillion miles away, you know? And so I so believe that was purposed, and I will go to my grave believing that we were always supposed to pursue him. I will go to my grave firmly believing we were always supposed to walk away, too. But we were supposed to go, we always were. A few months later, the tiniest one year old I had ever seen hit my inbox and I wanted to say no. But we didn’t and I knew we never were. And I so remember sitting on my couch reading Wyatt’s story through tears because I knew, yet again, it wasn’t a coincidence. As we were praying all those prayers a whole year ago, a zillion miles away Wyatt’s mom was doing exactly what we were praying for. As we were feeling burdened, Wyatt’s mom was in the late stages of pregnancy. While we were begging God to keep her and her baby safe, He did. As we were asking God to be in the delivery, He was. While we were praying prayers for life to be chosen, He chose it for him. As we were feeling burdened with a sense of urgency, God was saying: Yes. But not yet. I have something else for you, and then Yes. And I so believe that was purposed. Every last bit of it. We could have said no. We really could have. But oh my word am I glad we didn’t. Wyatt Mukisa, you are our greatest blessing. Truly. You were purposed, always. You were designed for greatness. You were sought after. You were chosen. You were wanted. You were a leap of faith. You were our best Yes. We’re glad you’re here, buddy boy. You’re our favorite. I’m just a girl trying to find some humor in parenting. Because what doesn’t kill you makes you funnier, right? I created a game today where I lay down and Wyatt rolls cars on my back while my eyes are closed. So basically I won today. In our house we pretend water is different colors. It just makes day drinking easier to explain. If I were going to prepare a friend for life with a toddler I would hide one of every pair of shoe and ask them to find them as I stand there and scream. Also? You need to be somewhere that requires shoes 10 minutes ago. If I could describe the toddler in one idea it would be this: They don’t give a damn. They give zero actual damns. Ways I have been a jerk today: I wouldn’t let him consume trash, I asked him to stop licking the potty, I wouldn’t let him play with a knife, I wouldn’t make him pasta. Also it’s 7:45 a.m. The toddler is like a PMS-ing adolescent girl. Except the symptoms last until they’re five. Wyatt can reach the light switch in our playroom. So if you would like to experience a seizure come on over! One time Wyatt elbowed me so hard in the chest he burst a blood vessel. Life is fun. One time I texted my husband actual tears because, see above. There is nothing more rewarding than hearing about how perfect my child was at his grandparents house. Wyatt slept 19 hours last night! Wyatt ate arugula and asked for more! Wyatt wrote the first draft of his college essay! “Mommy play!” is like the cutest way of inviting you to come sit and do everything wrong. Hell hath no fury like a 2 year old who did not want his hot dog cut up. JK. Hell hath no fury like a 2 year old who wanted to play with a doll he pooped on but wasn’t allowed to because, HUMAN FECES. He cries when it’s time to take a bath and he cries when it’s time to get out. Toddlers make like this much sense. My favorite thing about the toddler is that they change their minds every .04 seconds and refuse to tell you about it. And by favorite I mean: Where’s the Advil? Nothing can prepare you for becoming a parent of a toddler, but I feel like trying to dress a cat would be a great place to start. Kroger had a 2 for 5 sale on blueberries this week which means Wyatt will hate blueberries for this week only. There is nothing more safe than driving while parenting. And by that I mean I’m pretty sure I could drink and drive safer than I can parent and drive. Because what’s worse? Waking up a toddler from a car nap or peeing on yourself? I don’t care about your schedule, if you have one or if you don’t. I don’t care if the same things happen at the same time every day or if they just happen when they happen. You’re doing a great job. I don’t care if you breast feed. I don’t care if you buy formula. I don’t care how long you do either of those. You’re doing a great job. I don’t care if you’ve ever flung poop onto a check out counter and acted like it didn’t happen, and I don’t care if you don’t have a clue what that experience is like. You’re doing a great job. I don’t care if you let your kid cry sometimes. I don’t care if you never do. You’re doing a great job. I don’t care if you’ve ever had middle of the night fights with your husband over that tiny human you both love, who won’t stop crying and won’t sleep ever, and neither of you know what to do other than fire cuss words at each other. I don’t care if you’ve got the no sleep up all night with a crying kid for all of the nights figured out. You’re doing a great job. I don’t care if your kiddo goes to a private school or a public school. I don’t care if you home school. You’re doing a great job. I don’t care if you co-sleep or if you don’t. I don’t care if you sometimes co-sleep because sleep is golden no matter how it goes down. I don’t care if your baby sleeps in your room or in another room. You’re doing a great job. I don’t care if you work or if you stay at home or if you work from home. I don’t care if your kid is in day care or has a nanny or stays with your mom. I don’t care if you went back to work because you had to or if you decided you wanted to. I don’t care why you’re staying home. You’re doing a great job. I don’t care if you’ve ever yelled at your kid. I don’t care if you haven’t. You’re doing a great job. I don’t care if you buy only organic. I don’t care if you buy canned vegetables. I don’t care if hot dog consumption is at an all time high in your house. I don’t care if you make dinner every night or if take out is the name of your game. You’re doing a great job. I don’t care if you put your kid in time out. I don’t care if you spank. I don’t care if y’all just talk it out. You’re doing a great job. I don’t care if your kid throws a tantrum at my house or at the park or at the grocery store. I don’t care if they never have the one meltdown not ever. You’re doing a great job. I don’t care if you’ve showered or if you haven’t. I don’t care if you’re in work out clothes always or if you put actual real life clothes on the majority of the time. You’re doing a great job. I don’t care if your kid watches TV or if they’ve never seen a TV show a day in their life. You’re doing a great job. I don’t care if there are dishes in your sink or clothes piled high in your laundry room. I don’t care if the dishes and the laundry are always put away. I don’t care if your floors are kind of sticky or if they are mopped weekly. I don’t care if there are toys all over your house or if they’re thrown all in one room. You’re doing a great job. I don’t care if dinner is a 4 or 5 or 7. I don’t care if the time you serve dinner is solely based on how the afternoon goes. You’re doing a great job. I don’t care if you’re smack dab in the middle of a really hard season as a parent and I don’t care if you aren’t. I don’t care if you don’t really know what that means either. You’re doing a great job. I don’t care if you have absolutely no idea what you’re doing as a parent. I don’t care if you do. You’re doing a great job. I don’t care if being a mom is the hardest thing you’ve ever done, ever. I don’t care if it’s the easiest. I don’t care if you’ve found your mom groove yet or if you’re still waiting to find it. You’re doing a great job. Because what I’m learning is that mom guilt and comparison are the easiest things in the world to engage in.They really are. I lie at the playground all the time because, guilt and comparison. (We can talk about that another time. I’m trying to quit.) I’ve almost had to get off Instagram because, guilt and comparison. I’m finding that it’s just so easy to forget that I’m doing a great job. I already am. And so are you. Because let’s be real, no matter how you’re playing this mom game? You’re doing a great job. Promise. I have said exactly one million times since becoming a parent that if I were a bad guy of sorts, and people were trying to get information out of me… No need to torture me or deprive me of sleep or food. No, just put me in a room with a crying baby and I will tell you all the things in 90 seconds or less. Literally all of the things. JUST MAKE IT STOP NOW PLEASE. I hear people say things like: “It’s so funny when toddlers get frustrated (i.e. cry their heads off over something ridiculous)” or “I think I’d just laugh if my kid threw a tantrum in public (Side note: I can’t even with the fact that some people have lived multiple YEARS with their child and never had a public tantrum. I have been with mine for exactly 19 seconds and have picked his flailing body off of so many tile floors it actually makes me want to die a slow death just thinking of it all. )” or “Even when mine throws a fit I think it’s so cute” or “Aww, sweet Wyatt’s a crier? Awwww.” And I’m like, ARE YOU ALL ON ACTUAL DRUGS!?!?! Because I hate it. I think exactly none of it is funny or cute or like so fun or awww. I’m just not there yet. HOW DO YOU GET THERE? Someone write THAT blog post please. Oh right, paper bags. So several weeks ago I came across an old blog post of Glennon Melton’s and was like, OH MY WORD. YES. I FORGOT ABOUT THAT. I had read it before, back when I was not a parent… So I totally read it like: “Good Lord. I will surely never feel like that or need to do that. That’s so funny though that she feels like that and needs to do that. I will laugh at this because this will never be me.” Right? Because we were all idiots before we had kids. Anyways, she talks about how she doesn’t do well with the crying and the tantrums and the we were having such a fun time… WHAT THE HELL JUST HAPPENED?? moments of parenthood. She doesn’t love them or even like them. They make her crazy. Her solution? Put a paper bag over her head. Her children are still screaming. They are all still in the same room. She just has a paper bag on her head. She even put a smiley face on the paper bag so her kids can remember these times as happy. 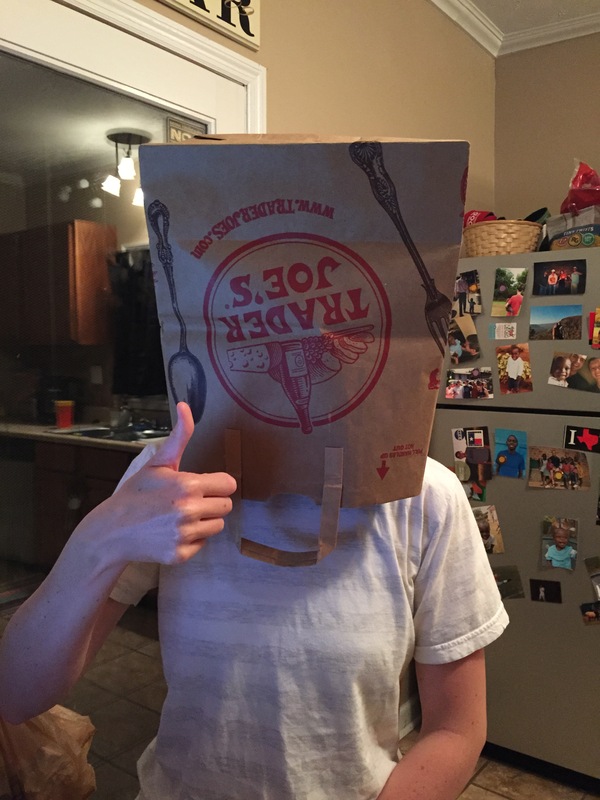 But for some reason the paper bag on the head makes her feel less crazy and less anxious and more like all of the things will actually be okay. AND SO I STARTED DOING THAT. Putting a paper bag over my head. And it works so good! I swear to you! It really does make me feel less like, THE WORLD IS ENDING and more like, IT’S ALL OKAY HERE IN THIS PAPER BAG. It also makes me die laughing. Every. Single. Time. It also *sometimes* makes Wyatt stop crying because, WHAT IS ACTUALLY GOING ON? And so now when Wyatt won’t.stop.crying I just look at his sweet little face and say the following, “Mommy is going to go put a paper bag on her head. I love you so much.” And then I do just that. All I’m really trying to say is: try this y’all. Motherhood has made me crazy. Like, actually crazy. Living with an almost two year old is like, how do I say this, ridiculous. It is also awesome, blah blah blah, but it is mainly ridiculous right now. I find myself saying the dumbest stuff to my child’s actual face. The kind of stuff that literally makes no sense. Like, the second it leaves your mouth you just know it’s going to be bad, but you finish the sentence anyways BECAUSE IT’S HOW YOU FEEL OKAY? If you choose to jump off of that I will not help you if you fall and hurt yourself. Yes I will because duh. To the tune of Old McDonald Had A Farm: If you hit me one more time, I’m going to cut your hand off. That is just not true. Mainly because it would be messy. But also because jail. If you throw one more tantrum you are going to bed. Except it’s 10 in the morning. We are leaving. You need to come with mommy or mommy is going to leave without you. Well that’s ridiculous for one thousand reasons. If you choose to bring your cars to the playground I will not hold them for you. That’s a load of crap. I will hold them. Every last one of them. You need to stop crying or else. Or else what, Courtney? OR ELSE WHAT? You need to stop throwing your food or you will not get anymore today. I’m going to eat a piece of cake if you throw one more fit. If you slam your fingers in that door I will not care. Those are actual sentences that left my mouth and went into my child’s ears, BECAUSE I’M SO GOOD AT BEING A PARENT. Anybody else say stupid crap to your kids? No? Just me. WHATEVER YOU’RE ALL LYING. A few weeks ago Wyatt and I went to the library for story time. On our way home I got cocky and decided we would stop somewhere for lunch because, I GOT THIS OKAY. Stopping anywhere ever with a small, active, stubborn human being is… an adventure? We’re also in the middle of a really sweet tantrum phase, which is awesome said no parent ever. It helps zero percent that this child of mine is, I swear to you, going to be a politician. The child smiles and waves and winks and says “Hi” in the cutest voice ever TO EVERYONE. He gets all kinds of pissed when we won’t let him walk around and shake hands and tell everyone he’s running for president in 2098. It’s hilarious and then it’s OHMYGOSH. SIT ON YOUR BOTTOM AND EAT YOUR FOOD NOW, you can decide if you’re a republican or a democrat later for goodness sakes. It also helps exactly negative percent that we are the center of attention everywhere we go because HOLY CUTENESS. It is really kind of embarrassing. I mean, strangers… literal actual strangers… come up and offer to babysit Wyatt. I’m like, I cannot with the fact that you are a stranger and we are at Chili’s and you are offering to babysit my child. And have you ever heard of stranger danger? Because YOU. It’s just really hard to get your child to eat (or really do anything productive) when people are constantly coming up to him and trying to touch his hair and his arms and squeeze his cheeks and talk to him. I don’t know. Call me crazy. It’s not like I’m trying to climb Mt. Everest with him or something. I would just like for him to sit down and eat something. Because heaven help me when approximately two seconds after we throw the food away that he did not eat because he was making eyes at you the whole dinner time, he throws down BECAUSE HUNGER. So like an idiot I stopped for lunch with my toddler. We stopped at a “do it yourself” restaurant. And by that I mean we didn’t have a waiter. So I stood in line with my politician who is actively waving to his people and flailing his tiny body around in my arms because DOWN DOWN DOWN. (P.S. I now understand those human leash things?) So I’m pointing at things and talking in excited voices and trying to make a fun adventure out of waiting in line because that is what my life is right now. And it’s just not really working. By the grace of God we make it to the place where we order and then I almost cried when I had to try and find my wallet in the chaos that is the diaper bag. But I found it… PRAISES… and just as I uttered, thank you Jesus we’ve made it through, I forgot that I had to sign the freaking receipt with exactly zero hands and a flailing child attached to my body. Call me stuck up, but I feel like parents of small children should be exempt from signing receipts. Just a thought. And then this: Put wallet back in diaper bag. Reposition child. Apologize to person behind us for holding up the line. Ha… Ha.. Haaa. Grab tray full of food. Pray to the Lord Almighty that we make it to a table without dropping 1) the child and 2) the tray of food. Find table. Put tray down. Go grab a high chair. Return to table with said high chair. Child is now yelling, “Beans. Beans. Beans.” Too soon, my young one. Go get napkins and forks and spoons. Return to table to put them down. Go get drinks. Return to table to put them down. Child wants DOWN. Child wants BEANS. Child wants ANYTHING OTHER THAN WHAT IS HAPPENING RIGHT NOW. Go get salsa. Return to table and sit down. HALLELUJAH. Eat food for exactly 19 minutes. Toddler is done. Which means I am all done. Can someone just put that salad in IV form for me please? Thanks! Pack up diaper bag. Hand child a toy for “transition.” Put child down. Stupid. Run after child and pick him up because duh. Hold flailing, crying child and put high chair away. Walk back to table. Walk to trash can for first round of trash. Walk back to table. Child sees a dog, hyperventilates and starts yelling: “puppypuppypuppypuppy.” Grab last round of trash. Go throw it away. Walk back to table and grab diaper bag. High five, girl. YOU DID IT. It took me a while to get over her asking me that. Really, it took me a while to get over myself. I hated so much that she asked me that. I hated so much that I really could have used help in that moment… throwing away trash for heavens sake. I hated so much that someone else thought I looked like I needed help. And then after I got over it all, I was obsessed with the fact that she asked. Who does that? Exactly no one. Motherhood is teaching me a whole lot about pride (and patience and kindness and selflessness and love and and and). And so I’ve come to this conclusion a few months into parenthood… It’s okay to actually need help. It’s okay to LOOK like you need help. It’s okay to accept help. What I wish I had said to that girl at Baja Burrito? “Girl. The answer is yes. Could you just throw away this trash for me? Thank you so so much. And thank you so much for even asking.” Because really, the answer is yes. The answer is always so much yes. AND THAT’S OKAY. And also? Moment of silence for waiters and waitresses. You are the reason I venture out of my house alone some days. Hear me when I say I LOVE being a mom. It is literally the most fun. Every day is hilarious and awesome and sweet. I love my child an insane amount. He will probably never know how much I wanted him. I’m basically obsessed with him. Yes. Hear me when I also say that being a mom is ridiculous and hard and sometimes I think I’m seriously going to lose my mind. Yes. Hear me when I also say that this post is written in sarcastic font. Yes. Toddlers are hilarious and absurd and like the sweetest things ever. They are all the things. Every last one of them. Dustin and I met up at our kitchen table to discuss some of the hilarious/ridiculous/weird questions we find ourselves asking these days. Because toddler. Why am I awake? Because toddler. Why do I have a human being sitting on my lap while I pee? Because toddler. Why am I crying? Because toddler. Why am I drinking? Because toddler. Why is there poop on the wall? Because toddler. Why am I singing The Backyardigans song at work? Because toddler. Why is this broken? Because toddler. Why am I eating dinner at 4:30 pm? Because toddler. Why are there toys in my dishwasher? Because toddler. Why am I watching Clifford all by myself? Because toddler. Why am I hiding food in hummus and peanut butter and refried beans? Because toddler. Why am I so tired? Because toddler. Why is this sticky? Because toddler. Why does this smell? Because toddler. Why is this wet? Because toddler. Parents of toddlers: what else you got? Let’s laugh together BECAUSE TODDLER.